Daily, every time I see something interesting on the internet, I saved and then classify it into different sections for storage. In earlier post, I make a small list of handwriting fonts. I look around, select fresh free high-quality fonts and present them to you in a brief overview. Today, you’ll find some very nice fonts to use for your work. Segoe, is a beautiful and elegant font. It’s used in almost every Microsoft branding campaign ranging from posters to logos, most notably Windows Vista. Segoe is a series of typefaces named after Segoe Road in Madison, Wisconsin, where one of Monotype’s engineers lived. The Segoe name, although originally registered to Monotype, is a registered trademark of the Microsoft Corporation. 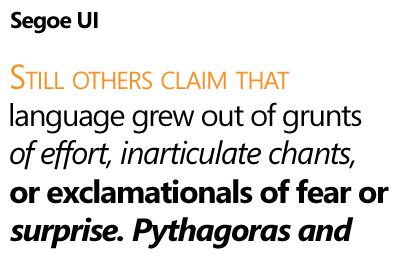 The design of Segoe UI improves the reading and scanning of text while leveraging ClearType. The overall approach to font size increase and font usage creates consistency across Windows and applications for a better experience in all languages. Calluna created by Jos Buivenga – a Dutch designer. I think it is one of the most elegant serif fonts I have ever seen. Calluna is the designer’s first serifed text family — a robust, clean and contemporary face with interesting details and a forward flow. Thanks to its clarity, it makes for comfortable reading even at extremely small point sizes; its striking details make sure that it can also be used as a display font with personality. This is another greate fonts which created by Jos Buivenga, you can miss it. It has auto-ligatures (no OpenType programs are needed). With a complete character set and a few other fine OpenType features it is hard to resist.